Do you create handmade felt? Are you a needle felter or wool felt maker? Grab these totally FREE printable tags or labels for your needle felted or wet felted items! 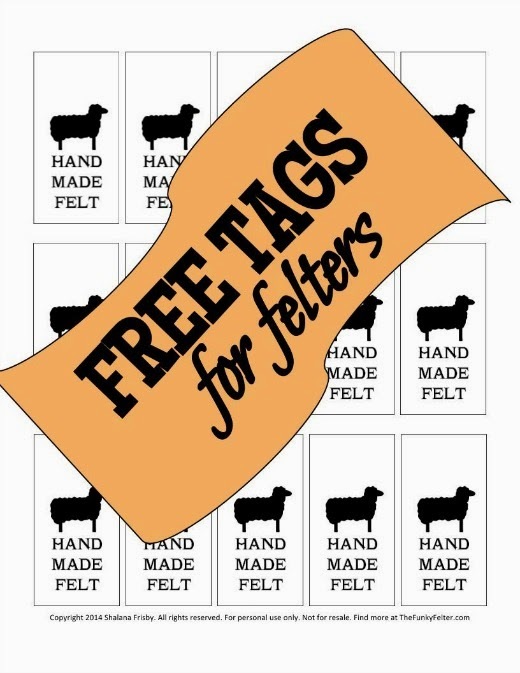 Printable tags especially for the felter or feltmaker. Whether you needle felt or wet felt wool or a combination of both techniques, these "Hand Made Felt" tags have an adorable little sheep that will look nice hanging on your hand crafted woolen gifts or craft show items. Simply click on the link below to download the printable tags file for your personal use. As a long-time feltmaker, I know it can be hard to find tags and labels specifically for felting...so here you go...some FREE tags just for the felter! I hope you like these free printable tags and find them useful. Please remember these are for personal use to print and label your own handmade wool items for gifts or for sale. These are not for resale in digital or print form or any other form for profit. If you have questions about their use, don't hesitate to contact me. Thanks a bunch! If you share these tags (and I hope you do! ), please be sure to link directly to this post and not the file itself. CLICK HERE to download my free "Hand Made Felt" tags. Copyright 2014 Shalana Frisby. All rights reserved. For personal use only.